Hi everyone! 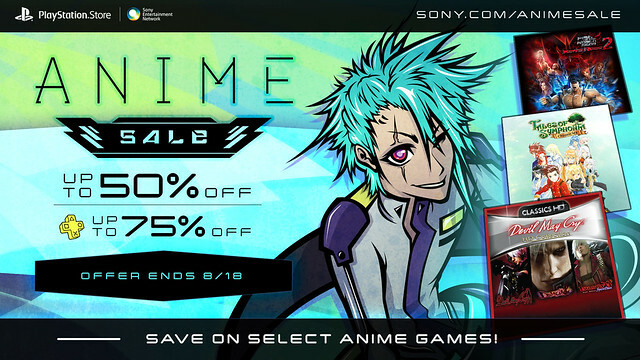 Starting tomorrow, we are discounting 17 games and a bunch of movies and TV shows as part of our Anime Sale. You can get up to 50 percent off a great selection of anime games, and if you are a PlayStation Plus member, you get an added bonus, receiving up to 75 percent off. *Movie pricing and availability is for US only. Canadian pricing and availability may differ. What games and movies are you planning on picking up this week? dang to bad I got alot of these already. Oh cool,,,,Damn it,need to buy another Vita memory card,I wish Sony released a 1 TB memory card for Vita. My god how does Playstation know my weakness? Nice sale, though I already own the ones I have any interest in. Good for those with less in their wallets. wow thats an amazing sale and even more if you are a plus member.one question are the bleach seasons 16 and on dubbed or subbed only….? as of know i’m thinking on getting tales of symphonia.thank you sony! personal request: could you guys lower the price of the new spiderman movie because last time i checked the price was too high for me to own. Also, just found out that Bleach is subbed with English cc files. Great! Im gonna get DMC HD! Thanks for the heads up on this week’s sale. Hopefully you can do this every Monday! Every time I see a post from Chieh Chen, I know it’s going to be good. So much to choose from! HOW DARE YOU GIVING MORE FALSE ADVERTISING AND SALES?????? Jumping all over that One Piece sale :D this is probably the first time I’ve ever seen those titles on sale. Why no sale on Chrono Phantasma on Vita? I’ve got P3P on Vita, but for $2.50 I’ll definitly bite on FES. Guess I’ll save P3P for a FemMC playthrough. I’ll have to pick up the One Piece games for that price. Unlimited World Red was actually kind of fun! Looks like the best deals on there too, and they have Plats! yes! I was going to pick up naruto impact last week but decided to wait now I’m glad I did. picking that up, Ys: I & II and maybe one piece and DBZ since it’s a good price. thank you sony! Wow, how is it that I’ve never even HEARD of the Saint and Mamorukun games?! I watch this industry like a hawk… never saw them mentioned in any press release or news article, ever. Naruto UN Impact and Hakuoki Warriors aren’t currently downloadable from the PS Vita store. Will that change tomorrow? This is the first I’ve heard of Mamorukun Curse, but Saint Seiya: Brave Soldiers was reviewed by most major outlets. I think there could’ve been more sales for the games, but hey thanks! Wow interesting sell. I have my eye on maybe Devil May Cray HD and Dragonball Z Battle of Z. Will be quite fitting since I’m going to to Battle of Gods tonight with a friend. I know it’s too soon but I wish Dynasty Warriors Gundam Reborns was on sale as well. Is any of the DLC for the included games also on sale? Nothing for me, I was hoping to see Danganronpa! Honestly, stay far, far away from Battle of Z. As a Dragon Ball fan (I have all 7 balls tattooed down my spine) I found it incredibly disappointing. Poorly done two button, boring, repetitive combat where you end up penalized for the AI being a couple beers short of a six-pack. It was a slog to even get to the end of the canon stuff, let alone through the alternate storyline and up through the non-canon stuff to the fight with Beerus. It’s not worth the time. It’s really, really not worth the time. Thank you for FINALLY getting back to posting sale information on Mondays. Much appreciated, it’s so much easier to plan my game spending on any given week this way, as opposed to having to wait until sometime Tuesday night just to find out what’s on sale, when retail stores you know their sales the previous Thursday and certain other game consoles update early in the morning. Now I can plan my spending better again yay! Keep the Monday sale posts coming please. I don’t think I’ve ever been less interested in a sale, but it’s cool to see people excited. Variety is always good. Enjoy! Also, as others have said, it’s nice to get the sale announcement on Monday. It’s a minor thing, but it’s preferable to just refreshing the store every Tuesday to see what pops up. This list is seriously lacking some JRPGs. I am so disappoint. That’s a lot of Shonen Jump in the TV and Movie sections….None of which interest me. I already own most of the games I’d be interested in, but BlazBlue CSE at $3.75 is a STEAL, if you don’t already have it through the IGC or (like me) an earlier sale. Actually, you may as well pick up both BlazBlue titles (though I wish the Vita version of Chrono Phantasma was featured in the sale too). They’re FANTASTIC fighting games, and ones worth playing through even just for the story. Sony, why so much hate towards my wallet?? Kinda wish the Nep-Nep and BlazBlue anime series were on sale (even though the latter is really bad), but let’s be honest – I don’t think a lot of people would want to buy episodes of anime series that aren’t dubbed….yet. At least both are getting Blu-Ray releases (and English dubs) in the future. Accel World and Dragon Ball Z are definitely on my list! I wish they would do the persona series. Actually I’ll add Persona 4 GOLDEN (and its anime series) to that list too. Actually, more Japanese Vita games in general would’ve been nice, as opposed to just DBZ. This will require some looking into for sure these sale are spectacular I just might buy something. Definitely in for Tales of Symphonia for that price! I’ll also buy K the series as well.